The Westend of Glasgow is far different from the central streets of Glasgow which are decorated with big shopping centres and the fast food chains on every corner. I feel that Glasgow, although the bigger city, is often overlooked over Edingburgh. It's a shame especially when the Westend has so much to offer. Kelvingrove houses one of Dali's master pieces and there is of course the Ubiquitous Chip a well famed restaurant. One cold Scottish day X and I were in the Westend of Glasow having taken the clockwork orange from the city centre. Food was first up on the agenda and after wandering around in circles a few times we decided upon Tapas at Cafe Andaluz. They have another two restaurants in Scotland so a small chain. 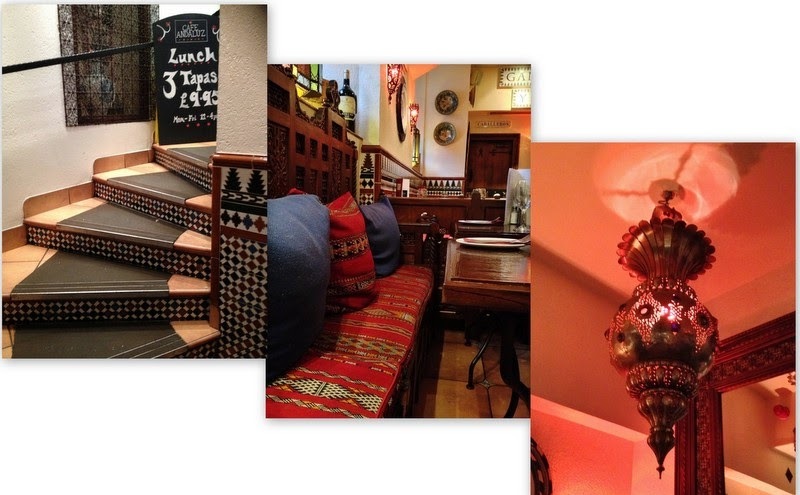 The decor is more Moroccan than Spanish but the furnishings are amazing. You could spend the whole meal just looking around you. For starts we ordered some bread olives to nibble on whilst we waited. Carrillada de Cerdo - braised pork cheeks in red wine, smoked paprika, chilli and honey. I didn't like it, what I was expecting to be a strong flavoursome dish turned out to taste like a poor stew. Patatas Bravas - another staple when ordering tapas. I miss great patatas what happened to mini cripsy fluffy potato bites in a spicy chunky tomato sauce? Chorizo al Vino - chorizo in red wine sauce. Not hard to get wrong... Unless you have cheap chorizo. Spanish tortilla - you can see from the picture this wasn't cooked as well as it should have been. Pollo Rebozado Con: Chicken fillet in a crispy batter with Spanish honey and wholegrain mustard, this actually wasn't too bad. I really don't want to put you off going to Glasgow's Westend, there are plenty of good places to eat. It just so happened that on this occasion we chose poorly. I hope their other restaurants are better, they must be doing something right to have opened three!